Mitsubishi Heavy Industries, Ltd is one of the largest employers in Japan with over 80,000 employees and is the number one heavy industry manufacturer in the country, producing around 500 products that make a significant contribution to the lives of people worldwide. President and CEO Shunichi Miyanaga discusses the meteoric rise of one of Japan’s most prolific producers and where it’s headed next. You joined the MHI more than 44 years ago and have successfully guided the company in the position of president for more than three years. Can you share with us what you believe to be MHI’s institutional values that have positioned it to where it stands today? Indeed, Mitsubishi Heavy Industry (MHI) is a company with a very long history that dates back to 1884. Originally MHI started as a shipbuilding company, but in 1934 developed into other fields, including heavy machinery manufacturing, engine systems, airplanes, power stations, railroad cars, etc., and established its position as the largest private firm in Japan. After World War II, the company started to transform and we started to focus on industrial machinery and social infrastructure machinery. Back in this period, the Japanese economy and Japanese society were developing very quickly, and we were just growing in line with the economy. We benefitted first from the shipbuilding industry development, then from the steel industry development followed by the automotive sector development. Around the same time, the oil and gas sector and its related transformation industries started to flourish, with technologies imported from the US and Europe. From the 1960s and 70s, we imported a lot and gained many licenses. After such a period of growth, some of the technologies were transferred and we developed our own technology. Our principal market was Japan of course, but also Southeast Asian countries, such as Korea and China. We had exporting relations with other countries as well, and of course with the US. We experienced strong business growth up until the very early 1990s. In the early 1990s, our product line and some of our markets reached their maturity and saturation point, and from then on, we experienced a fairly long period of stagnation, sitting around the $26-$27 billion mark of annual turnover. During this period we tried to evolve our company, we tried to explore other countries, tried to find new businesses, and new products. By 2010, MHI had found of new stage of growth. We changed our company and of course focused on new technology. Our product lines are much less broad: we eliminated some of our saturated technology, and reduced our product line to about 500 products that we have today. MHI operated in the fields of heavy equipment, industry components and machineries principally. But at the same time we were continuously exploring technology and other fields such as the aircraft industry, the defense industry, including products like fighter jets, rockets and other types of new technology. We started new programs in this field, which were very encouraging and stimulating, though it took us some time to turn these new developments into real business opportunities and results. We decided to concentrate on these new areas, the space and aircraft industry and the energy and environment sector. In order to best operate in the energy and environment sector, we needed to scale-up our business and decided to form joint ventures and start-up businesses to best compete in this field, such as an effort to acquire Alstom. Eventually the bid failed, but this shows the directions that we are taking and our intention to expand and grow our operations and contribution in this field. MHI offers very advanced technology in some specific areas, as well as state-of-the-art equipment and components. We are one of the best suppliers of gigantic items for large industries, such as gas turbines; however when it comes to medium and small sizes, we need to provide new and more competitive products like the ones that Hitachi can produce. Gathering such kind of technology enables us to enhance our technological evolution and integrity as a company. I believe MHI has a very broad range of product lines and technologies that span over a century of development. To maximize and rationalize the use of our wide-ranging technologies, MHI has shifted to a structure of four business domains today, which are: energy & environment; machinery, equipment & infrastructure; commercial aviation & transportation systems; integrated defense & space systems. In addition, we are also trying to look more deeply at our products’ functions, capacities and required integrated and control systems, and rationalize these in our equipment and hardware. For example, we just merged our power station business together with our environmental business. Some of our product lines, such as our desalinization plants or our nitrogen oxide removing apparatus, had their environmental systems in a different machinery business division, but it made more sense to place those environmental businesses into the power station and energy businesses. Usually the big coal, gas and oil-powered stations have a great deal of emissions, so I believe that if they are integrated, a variety of services and some of the controls can be further advanced. By doing this, we are moving and reshuffling our product lines into a variety of categories – energy & the environment and transportation. In regards to the transportation industry – which covers land, sea and air transportation – all these businesses naturally belong to separate business divisions, but we regrouped them so as to have one transportation business domain. By doing so we changed some of our service networks and control concepts. For example, when looking at the Dubai metro system, an enormous system, there is an enormous amount of know-how and technologies implemented to be able to carry out such a system. So, we are now in the process of changing engineering methods and supply chain management. It is a kind of reshaping and reshuffling of our integration methods, and it is an important basis to promote more innovative activities. MHI is also highly present in the metal industry, which is currently facing a severe recessionary period. We have entered into a joint venture with Siemens, so that both our companies can exchange their advanced technologies and can come up with newly integrated technologies and services. In this industry, the innovative side is not only the hardware, but also the control systems and software. At MHI, we are currently transforming ourselves from a hardware-oriented innovator to a total system-ended innovator. Another field where we are recording good progress is with our gas turbines. We have also now accumulated more than 65 orders for gas turbines from the US. We have other factories in Savannah, Georgia, where we have had already manufactured 13 gas turbines for the US market. In the US we have very good perspectives to collaborate with southern utility electricity companies, and had the opportunity already to experiment with our carbon dioxide recovery systems from the coal-fired plants. We started our recovery and reserve storage underground system in 2011 and completed this in 2014. Back then it was operated by MHI’s chemical plant business division as we had just established such a kind of division. Now they are dealing with some commercial plants, such as for enhanced oil recovery systems in Texas. The customers are a joint venture of NRG Energy and JX of Japan. Changing some of our product lines and business organization will incorporate such a kind of combinations of businesses. By doing so, we have been able to develop our new business opportunities in US and other countries. Abenomics have gone some way to revitalizing the Japanese economy, fighting deflation and cutting red tape across industry. 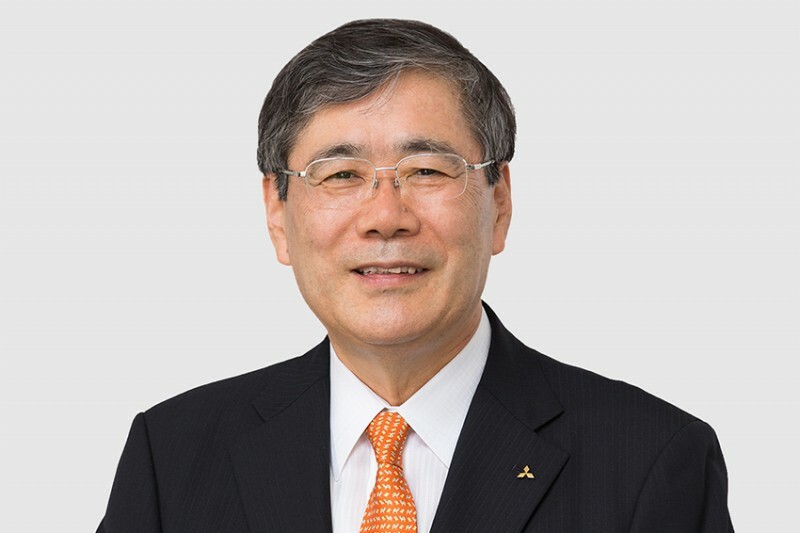 As a highly regarded business leader and vice chairman of the Keidanren, what in your opinion needs more attention in terms of further revitalizing Japan’s economy? Abenomics should be very highly valued, and the clear-cut policy from Mr Abe should help say farewell to the long-lasting deflation period that Japan has experienced. Although Japan’s GDP is not increasing drastically, I feel that the Japanese economy is recovering pretty well. If we take aside the current negative conditions, including the very low oil prices and natural resources decline, the Japanese economy would be able to show a much better performance and a higher growth and inflation rate. With improved market conditions, a curbed oil crisis, a curbed natural resources crisis, and with of course a continuation of Abenomics and its current decisive policies, we will be able to see a more stable economy without deflation. Japan’s long-lasting deflation issues are due by and large to deteriorated investment in Japan. However I believe that now with the measures in place, we should soon be able to say goodbye to deflation. To what extend is the group looking at the US market as a source of growth and revenues? MHI has long had a presence in the US and the world’s largest $18.7 trillion market still offers significant growth potential over the long term. There are a number of new and exciting chapters for MHI, including the commercial satellite launch market and the exciting release of the MRJ, a new state-of-the-art regional jet. How do you aim to create new value in global air travel? The global air market has its ups and downs. In the long term, I believe that this market will see a strong increase in demand and a rise in passenger volumes – not only in advanced countries but also in emerging countries, where the needs for new transportation systems are very high. There are many regions and routes where railroads and road would not be necessary nor economical; for example between New York and London, New York and Paris, New York and San Francisco, large airplane carriers are very convenient. What Mitsubishi Heavy Industries is pursuing now are niche market opportunities for local or regional commuting systems. Of course, we still need to learn a lot in regard to customer service and experience, yet at the same time, we have accumulated a lot of technological experience, know-how and expertise with such kinds of transportation and service systems, to guide their development. Now we need to continue to develop our commercial airplane technology and after the US market, which is our biggest market, we are trying to look for other markets, such as Southeast Asia, since it is a very familiar region to our company and operations already installed there. We can expect this type of certification in a few years time. How is MHI working to establish long-term partnerships with developing nations and further contribute to developing a lower carbon society? Mitsubishi Heavy Industry has been very conscious about climate change and environmental issues, and working toward realizing a low-carbon society, through its multifaceted technologies and a large focus towards renewable energies. For example we are developing most advanced gas turbine with enhanced efficiency, such as the gas turbine combined cycle (GTCC) technology which recycles the heat emitted by the gas turbine. At the same time, emerging countries need a lot of low-cost coal-fired plants. We have been working to promote our most efficient ultra super critical coal-fired power plant, which we have been exporting. At the same time, we are encouraging carbon dioxide storage systems. Our carbon dioxide recovery system is probably one of the most efficient technologies in the world. MHI holds thousands of patents globally, and intellectual property activities are an integral part of its business and R&D strategies. What percentage of your sales are invested in R&D and to what extent is IP integral to reaching your goal of exceeding the scale of 5 trillion yen by 2017? Our current turnover is about $36-38 billion, nearly $40 billion, and I expect it to reach $45 billion pretty soon. We spend approximately 3% of sales on R&D and IP maintenance programs. R&D is one of the very important engines for growth that we are prioritizing and we have been expanding our R&D activities substantially over the years. We used to concentrate on our in-house R&D activities, but now have completely changed our approach and policies and work more now with universities and advanced research institutes. In the US we have many of such cooperations in place, where we have sent some of our very capable engineers. We are now together working with MIT, Stanford, Texas University and several other institutes. In the United Kingdom, we work with Cambridge, Oxford and other universities. We also work with two universities in China and in Singapore, and we are currently developing relationships with universities in Australia and European universities as well. In addition to universities we are working also with some other foreign companies, some of which were even our competitors in the other fields. Competition worldwide is quickly expanding and we don’t want to be late in any game. How would you describe your role and the perspectives of the MHI Group within a turbulent and fast changing global security environment? In such kinds of troubled security situations, we need to constantly adapt. Because of its accumulated know-how and expertise on land, sea and air, Mitsubishi Heavy Industry can integrate and utilize a variety of very advanced technologies and propose state-of-the-art solutions to preserve global security. I believe that MHI is one of the most suitable companies to offer such kind of sustainable solutions. As a global leader, how do you ensure that you encourage sustainability across all of your operations? In order to best promote and enable sustainability, I believe that organizations need one thing: flexibility. Organizations need to always allow their members to change direction and implement changes in society and technology. Of course we are a technologically oriented company; we should focus on technological changes of direction. For the time being, we need to be very much conscious of the development of IoT. At the same time, we should not obsess too much. We should be very clear minded for such areas because we are not a professional company in IT, but we are a user of ICT. However, sometimes we should immerse ourselves into that world and look at ourselves from the information technology side. By doing so, we will be able to find ourselves and imagine ourselves in the future and of course this usually represents not one single opportunity but more than that. From time to time, we review and evaluate ourselves. By doing so, we will be able to adapt ourselves to the change. What would be your message to G7 leaders? I do hope the upcoming G7 summit would be the starting point of the revitalization of the world economy.